The candles are sold as a set of three. Most colors are offered as a set with the three shades of the color as shown. Some of the colors are only a single shade such as "Bittersweet". The candles are 10", 12" & 14" tall. 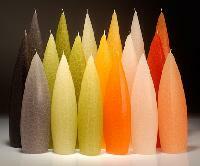 The cross section of these candles is an asymmetric triangular form with hard edges running vertically. This set has a tall light and a short dark candle. While this set has a tall medium and a short light shade.